Neostigmine is useful in treating patient with myasthenia gravis and stimulation of the bladder and gastrointestinal tract due to postoperative bladder atony and intestinal atony. 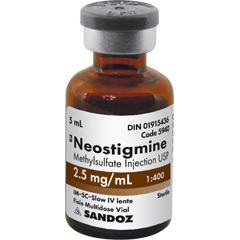 Anesthesiologist will consider neostigmine as a treatment against non depolarizing neuromuscular blockage due to vecuronium. Neostigmine may not causing psychosis or sedation due to its inability to cross the blood brain barrier. Neostigmine will reversibly inhibit acetylcholinesterase in the synaptic junction. There will be no degradation of the acetylcholine into acetate and choline. Acetylcholine level will remain elevated in the synaptic junction with increase stimulation of muscarinic receptors and nicotinic receptors. The common side effects of neostigmine may include flushing, diarrhea, nausea and bronchoconstriction.